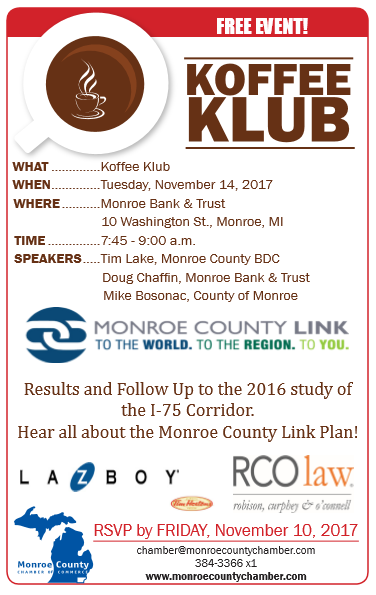 Tim Lake from Monroe County BDC, Doug Chaffin from Monroe Bank & Trust and BDC’s Chairman, and Mike Bosanac from the County of Monroe will be presenting on the Monroe County Link Plan at the Monroe County Chamber of Commerce’s Nov. Koffee Klub! This initiative is a result of the I-75 Corridor Study that was recently completed. Click here or the image to register and join us.